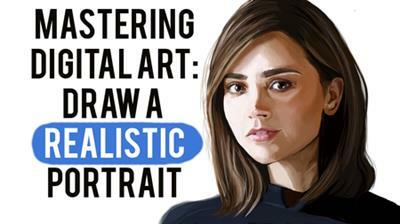 Have you ever wanted to master the art of digital painting but never quite known where to begin? Digital art is unlike any other art medium, it takes time, practice, and some decent advice and tutorials - this is where I come in! I have been a digital artist for 8 years, in which time I have done commission and freelance work -which has been published in both magazine and book formats. In this class - I have included everything I've learned in that time, I'm going to share my top tips, tricks, and vital pieces of advice you need to know in order to get started and improve your work! I am going to take you through everything you need to start digital art, right from the very foundation; Tablets (and where to get them cheap), Software (including industry standard as well as free software), where you can get THE best brush downloads available, and much more. I’m going to take you through my entire drawing process from how to blend color, how to use brushes, utilize layers, draw shadows, highlights, draw hair, and how to develop the initial sketch, all the way through to creating a finished piece. I’ll teach you how to train your mind to draw from a reference accurately so you can create incredible portraits and pieces so you can build a portfolio and sell your work. At the end of the class you can share your work with me for critique and guidance.